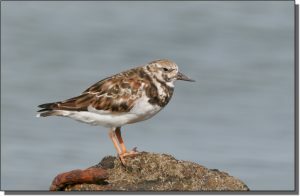 Description: Turnstones are chunky, robin-sized birds with short, orange legs; short, pointed, slightly upturned black bills; and distinctive coloration. The breeding plumage includes a bright rufous, black, gray and white pattern. In nonbreeding plumage, heads are brown and upper parts brown to blackish with little ruddy coloration. A brown bib is present and the legs remain orange. They are boldly patterned in flight. Similar Species: Within the Great Plains, Ruddy Turnstones shouldn’t be confused with other species of shorebirds. Comments: Turnstones characteristically “turn stones” and flip over shoreline debris with their bills to look for invertebrates. They nest on the arctic coastal tundra and winter along rocky, sandy and muddy shorelines along both the Atlantic and Pacific coasts. They often fly without stopping across the central Great Plains during migration. When they are seen, they are usually found singly or in small groups. 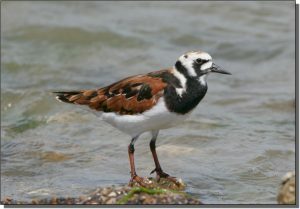 Large concentrations of Ruddy Turnstones are primarily found in southern coastal Texas or in the southern to central Canadian Prairie Provinces. A turnstone in the central portion of the Great Plains is a great find for birders.